The Sovyetskiy Soyuz was the lead ship of a class of very large, powerful, modern Soviet battleships intended to counter the large German battleships planned in the late 1930s. The Soviets ignored treaty restrictions, designing a behemoth displacing more than 64,000 tons at full load; only Japan’s Yamato and Musashi would have been larger. The main armament consisted of nine 16-inch guns, with a secondary battery of twelve 6-inch guns and a heavy antiaircraft armament of 3.9-inch guns and 37mm guns. Sovyetskiy Soyuz was designed for excellent protection with a main belt comparable to the Yamato class ships, but she was somewhat underarmed for her size; her armament wasn’t noticeably heavier or more capable than that of the British Nelson class or American North Carolina class, vessels that achieved the same firepower on about 2/3rds the tonnage. The monstrous battleships presented the Soviet shipbuilding industry with formidable challenges; the heavy armor and 16-inch guns proved especially troublesome. As war approached, construction slowed drastically, since the resources earmarked for the giant battleships were desperately needed for the army’s rearmament efforts. At the outbreak of war in June 1941, Sovyetskiy Soyuz was close to launching with her hull nearly complete and her armor and machinery installed, but she lacked her main turrets and was still years away from completion. By the time the Soviets were in position to resume construction, it was clear that she would have been nothing but a white elephant. She was broken up on the slip after the war. Sovyetskiy Soyuz is very much like Yamato—it’s a giant, 6-hull point battleship with a very high Armor rating. 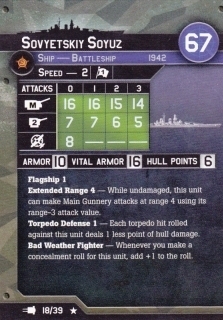 It lacks the very useful tertiary batteries or Bristling with Guns ability that most other battleships in this point range possess, which means it’s a little more vulnerable to destroyer swarms than similar ships. It does, however, come with a good AA rating thanks to its large amount of medium-sized AA guns. Her Bad Weather Fighter ability makes for a very powerful combo with Smoke Screen-creating destroyers. As with other huge battleships, steam boldly for the objectives and dare your enemies to do their worst. The Bad Weather Fighter SA is what helps to make this a rather excellent unit; mix this with a few destroyers with the ability to make smoke, and there will only be a 50% chance that your opponent will hit if not in the same sector. If they are in the same sector, this is twice as likely to evade any damage as the enemy ship. Take into account, after that, that it has 10 armor and 16 VA, and you have what is, almost without question, the most durable ship in the game, and ultimately not a bad buy. One of the most detailed sculpts in WAS, I still prefer the Hood though! The detail for the superstructure and the secondary/AA weaponry is acceptable, and though the guns of the turrets are all connected, they are easily discernible and don't look too bad. Overall, it's on okay sculpt, but not great.